SpamEater.Net is a managed server based solution to email viruses and spam. 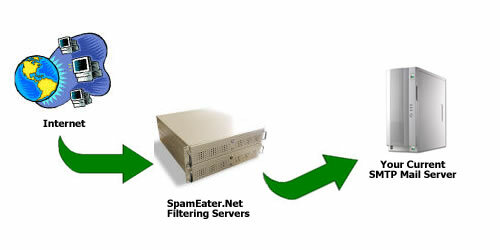 SpamEater.Net provides the filtering for spam and email viruses on our servers - there's nothing to install, or maintain on your end. With our Domain Filtering service, a simple change to the DNS (Domain Name Service) MX record for your domain is all that is required. Typically, within one hour of the MX record change being made, and your account setup here, SpamEater.Net will begin filtering the email for your domain. You can also then setup restrictions on your server to accept inbound email from only our servers to prevent spammers from bypassing our server and sending direct to yours. The SpamEater.Net service allows email from your domain(s) or email address(es) to be filtered for spam, viruses and undesired content and then the good email is relayed back to your current email server. The Domain Filtering service is compatible with any standard SMTP server for backend relay. Spam and viruses grow exponentially and threatens the ability to rely on email for business and personal communication. The cost is measured in lost and unproductive time spent wading through mountains of spam, and the high risk of deleting important messages during the manual process of deleting the spam email.